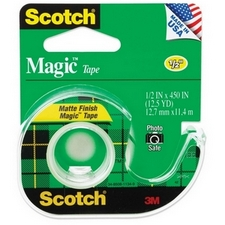 Magic tape with refillable dispenser. Matte finish allows tape to practically disappear on paper. Photo Safe. Will not yellow or dry out. Plus, it's easy to write on - very handy, that.